If you’re seeking for MS dynamics CRM Interview Questions and answers, you are at right place. There are lots of opportunities from many reputed companies across the world. According to research Microsoft Dynamics CRM has a market share of about 9.9%. So, you still have chance to move ahead in your career in MS Dynamics CRM. 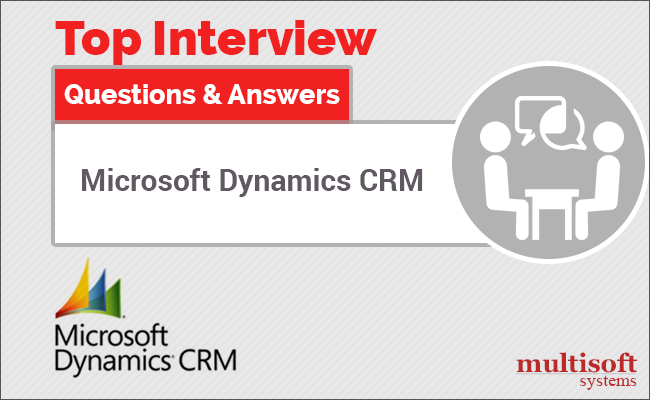 Multisoft Systems offers advanced Microsoft Dynamics CRM Interview Questions that helps you in cracking your interview & acquire dream career. What Are The Different Types Of Solutions In Dynamics CRM? Delete button: It removes the component from CRM system. What Are All The Steps To Create A Solution? Fill the required fields like Name, version. Select the Publisher record. You can join two table using Linked entity. You should always try to reduce the number of SWS calls that we make in the database. Often during code review it is explored that the number of Microsoft CRM web-service could have been reduced by making use of the Linked-entity concept. So we should always look for the opportunity to reduce the effort. A plug-in is a custom business logic which functions for assimilating Microsoft dynamics CRM 2011 with Microsoft dynamics CRM online. This integrating is to modify the standard behavior of the platform. What Is The Difference Between Dialogs And Workflow? Dialogs: It refers to synchronous processes which require user input, a wizard like interface. Workflow includes the automation of business processes from one party to another whose actions are as per the set of rules. What Is E-mail Router In Microsoft Dynamics CRM? Only the secured field values that you have access to repeat into the offline database. If you don’t have access to the data, it is not saved offline. Field level security profile contains all the fields from all entities which are allowed for field level security. Managed solution is a kind of complete package that we can distribute to others to install in their CRM organizations.